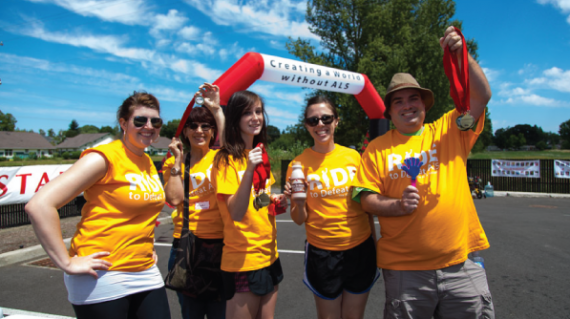 Ride to Defeat ALS on July 14 is a relaxing cruise through the Willamette Valley. The ride starts and ends in Mt. Angel, located just under and hour from Portland but seemingly worlds away. You’ll cruise along quiet rural roads, through the quaint Gallon House Covered Bridge, pass farmland and working fields as you sink into the landscape for the day. This ride has a little something for everyone, with routes of 25, 50, 62, 75 and 100 miles to choose from. You’ll love the friendly support every pedal stroke of the way, and the many friendly other riders. This ride just has a great community feel. The event includes a festival finish line party at the Mt. Angel Festhalle, home to Oregon’s large Oktoberfest.